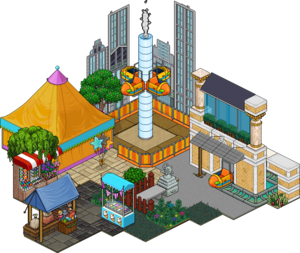 The Village Fair Bundle was a Furniture Bundle released on Habbo in July 2017. It was also re-released in February 2019. It was built mostly using various furniture that was previously released in the Habbo Palooza furniture line. Every user who purchased the bundle received a badge. According to Habbowidgets, 136 Habbos have this badge. According to Habbowidgets, 41 Habbos have this badge.